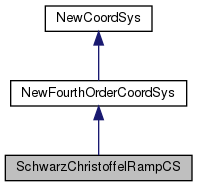 Conformal Schwarz-Christoffel mapping of a ramp. In the physical space, the corner is anchored at (0, 0) and the length of the bottom boundary is specified. Tolerances tested up to 1024 cells in X-Dir. Calculate the derivative of each coordinate vector. Return the angle of the ramp in radians. Return the location of the corner point in mapped space. Return the x-location of lower left domain corner in physical space. Get a complex in polar coordinates. Ramp angle (0 <= m_alpha < Pi). References m_c, m_k, and m_XiCorner. Referenced by mappedCorner(), and physicalDomainX0Min().